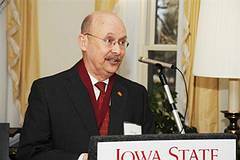 On Friday, Feb. 18, ISU President Gregory L. Geoffroy presented a medallion to Douglas Gransberg, ConE faculty member and InTrans faculty affiliate, as the inaugural holder of the Donald F. and Sharon A. Greenwood Chair in Construction Engineering. The Greenwoods, who graduated in the mid-’70s from Iowa State, established the endowed faculty chair to preserve and promote the excellence of the faculty in the construction engineering program. The Greenwood gift helped to recruit Gransberg, world-class faculty member and researcher, to Iowa State.